Protein kinases (E.C. 2.7.11.-) use the co-substrate ATP to phosphorylate serine and/or threonine residues on target proteins. 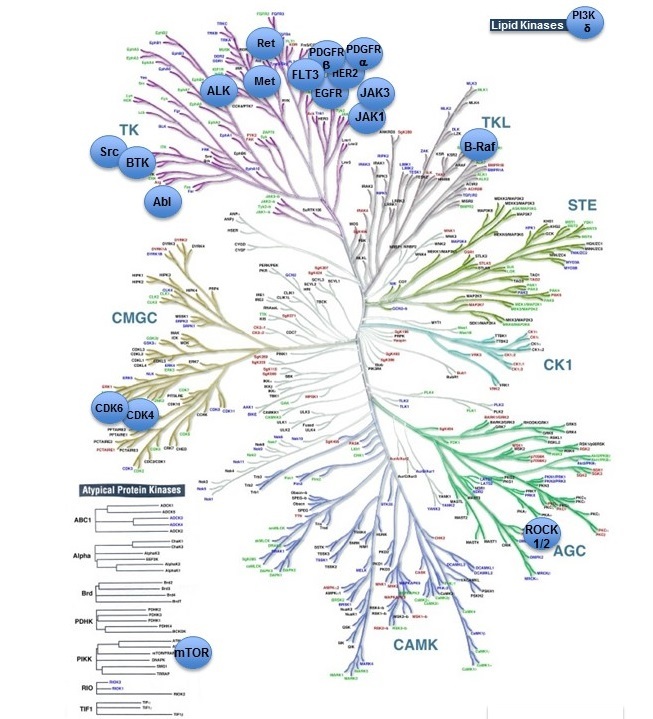 Analysis of the human genome suggests the presence of 518 protein kinases in man (divided into 15 subfamilies), with over 100 protein kinase-like pseudogenes . It is beyond the scope of the Concise Guide to list all these protein kinase activities, but full listings are available on the 'Detailed page' provided for each enzyme. Most inhibitors of these enzymes have been assessed in cell-free investigations and so may appear to 'lose' potency and selectivity in intact cell assays. In particular, ambient ATP concentrations may be influential in responses to inhibitors, since the majority are directed at the ATP binding site  . Doriano Fabbro, Elena Faccenda, David Gray, Peter Norman. Kinases (EC 2.7.x.x). Accessed on 26/04/2019. IUPHAR/BPS Guide to PHARMACOLOGY, http://www.guidetopharmacology.org/GRAC/FamilyDisplayForward?familyId=698.